Not to be confused with Spanish Royal Family. The last time the crown was shown at a public ceremony was in the Cortes Generales during the swearing-in of His Majesty King Felipe VI on 19 June 2014 after the abdication of his father, King Juan Carlos I. 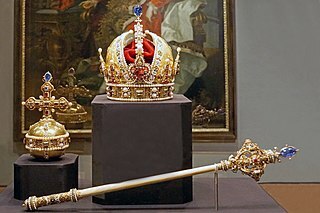 Since July 2014, the Crown and sceptre are on permanent public display for the first time ever in the so-called Crown Room at the Royal Palace of Madrid. The last Spanish monarchs being solemnly crowned were John I of Castile (1379), Ferdinand I of Aragon (1414), and Eleanor of Navarre (1479). Joan III of Navarre was crowned as late as 1555, although she ruled Navarre beyond the Pyrenees. 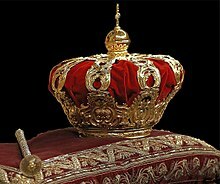 After the 17th century all Spanish monarchs have taken the royal rank by proclamation and acclamation before the Church and since the 18th century, before the Cortes Generales, although the royal crown has been present in these ceremonies. 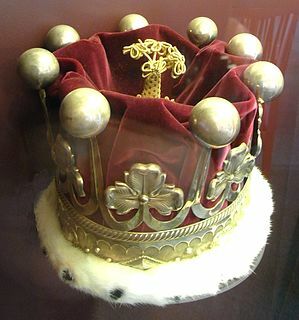 The commemorative crown (i.e. the corona tumular) bearing the marks of 1775, possibly made for the funeral of Elisabeth Farnese, queen consort of King Felipe V. The crown, made of gold-plated silver and no gems, displays the heraldic symbols of the founding kingdoms of Castile and León, with a turret and lion respectively. It was made by order of King Carlos III in Madrid. A sceptre, present of Rudolf II, Holy Roman Emperor, to King Felipe II; made in Vienna in the 16th century. 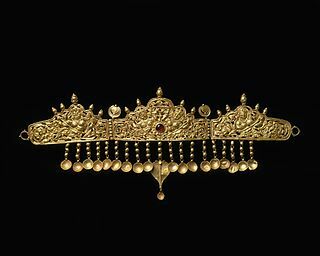 The jewels exhibited solemnly in the royal proclamations and other collections traditionally linked to the Spanish Crown, such as the Treasure of the Dolphin (which is currently exhibited in the Prado Museum) or others guarded in different places, are part of the National Heritage. The jewels worn by members of the Spanish royal family today (headbands, necklaces, decorations, etc.) are strictly private, are not linked to any institution, and are considered the personal property of the corresponding member (be it the king as private person, or some other relative). In that condition they were taken with them into exile in 1931 (proclamation of the Second Spanish Republic) and stayed out of Spain until 1975. 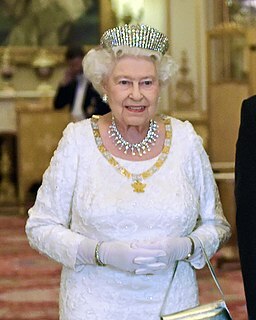 At present, the Royal Family owns a series of privately owned tiaras. Diadema de las lises or Tiara Flor de Lis, given to Queen Victoria Eugenia at her wedding by Alfonso XIII (1906). It is part of the known as "Joyas de pasar". Diadem of the Infanta Isabel (La Chata) or Tiara Mellerio, also known as the shells, made by Casa Mellerio (1867). Tiara Rusa, diadem of pearls and diamonds of Queen Maria Cristina of Hapsburg. Tiara Cartier, diadem of the Cartier house (1920), of art-deco style. Prussian Tiara, Prussian diadem, given by the Kaiser Wilhelm II to the Princess Victoria Luisa of Prussia, inherited through it by Queen Sofia. It was carried by Princess Letizia during her betrothal in 2004. Tiara Floral, floral headband, given by the Spanish Government to Queen Sofia on the occasion of her wedding in 1962. It was worn by the Infanta Cristina on her wedding day. Tiara Princess, diadem of pearls and fleur de lis, a gift from Casa Ansorena to Princess Letizia. Although at first the tiara was related to a gift from Prince Felipe to his wife, it was the jewelry itself that in 2010, in an article in the Hello! Magazine, confirmed that the gift was an idea that came from themselves. The corona tumular depicted on a portrait of King Amadeo I.
Webpage about the crown (in Spanish) from the website of Patrimonio Nacional. Letizia Ortiz Rocasolano is the current Queen of Spain as the wife of King Felipe VI. Isabella, Princess of Asturias, was the eldest daughter of Queen Isabella II and her husband Francis, Duke of Cádiz, twice recognized as the heir presumptive to the Spanish throne and given the title Princess of Asturias, which was reserved for the heir to the Spanish crown. She was married to Prince Gaetan, Count of Girgenti, who committed suicide just three years after their marriage on 13 May 1868.